The Chinese Crested has a happy and alert appearance. He combines the qualities of a sensitive companion, a calm lapdog, and playful elf. He can almost read your mind and will lie in bed for hours without moving a muscle. He is almost not interested in going out and running around like other dogs. The Chinese Crested is not gregarious, but he is intensely social and bonds quickly within his pack. He does not accept strangers easily. Once he falls in love with you, you will have a little stalker on your hands. This dog is likely to smile at you when he’s been naughty. He’s very sensitive and reactive, and he has a high social drive, all of which makes him needy. He is great with people he knows, but he’s likely to bite strangers. Unless he’s been trained and properly socialized to avoid this impulse. The Chinese Crested is a wonderful family dog who loves to be with the people in his life. He goes along great with kids, although you should consider the kids’ age and how they interact with dogs before bringing this dog into your heart and into your home. Because he’s so social and needy, the Chinese Crested can suffer from separation anxiety, which can lead to barking and destructive habits. The Chinese Crested is a great family dog who is sweet, affectionate, and playful. He’s a stable companion who fills his owners’ lives with love, laughter, and entertainment. The Chinese Crested is extremely agile and will have no problems climbing. What Price are Chinese Crested Puppies? The price of Chinese Crested puppies is between $400 to $600. How to Find Reputable Chinese Crested Breeders? A reputable breeder is passionate about their breeds and is knowledgeable about breed standards and genetic problems. The puppies and their parent dogs should be kept in the breeder’s home. They should not be outside isolated from people. A reputable breeder will allow you to see where their dogs spend most of their time and urge you to spend time and interact with them. Multiple visits are also encouraged before you bring the puppy home. A reputable breeder maintains a good relationship with a veterinarian. He should be able to give you documentation of the dogs’ vet visits, genetic tests, and results, as well as medical history. Every puppy should come with a written health guarantee. The breeder should ask you to sign a contract stating that you will return the dog should you be unable to keep the dog at any point in its life. The Chinese Crested is an exotic-looking small dog who does not actually hail from China. He is a slender, finely boned dog who is elegant and graceful. He’s a beauty, although he tends to win Ugly Dog Contests more often. It has been known by various nicknames, depending on where it was found. In Egypt, it is called the Giza Hairless. It is known as the South African Hairless in South Africa, and the Turkish Hairless in Turkey. The Chinese Crested likes to snuggle. The hairless variety of the Chinese Crested has soft and silky hair on the tail, lower legs, feet, and crest. The hairless areas are caused by a dominant gene, and these areas are usually soft and smooth. Unfortunately, a Chinese Crested dog can have two dominant hairless genes, which often leads to prenatal death. Powderpuffs, on the other hand, are completely covered with a moderately long, dense, soft, and silky coat. With a sharp and watchful expression, the fine-boned and slender Chinese Crested is one of the most elegant and graceful breeds. This dog is slightly longer than it is tall and moves with a lively and agile gait. How Big is a Full-Grown Chinese Crested? The Chinese Crested stands between 11 to 13 inches and weigh up to 12 pounds. What is the Life Expectancy of the Chinese Crested? 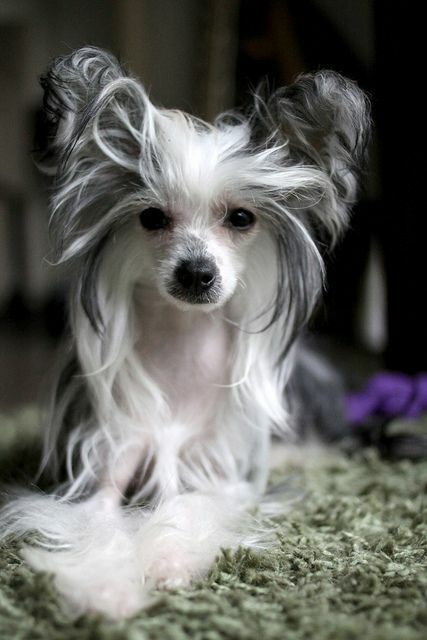 The life expectancy of the Chinese Crested is 10 to 14 years. Happy and watchful, the Chinese Crested loves and dotes on his humans. Expect plenty of kisses and snuggle time from this sweet and loving guy. Crested is not a good breed for insensitive trainers. This dog can be stubborn. But he also bonds tightly to his immediate pack. He’ll bark to alert and protect his home. He isn’t very yappy but he is unyielding about his guard duty and will be very committed to his job. The Chinese Crested is likely to smile at you when he’s made a mess. Despite its elegant appearance, the Chinese Crested is not choosy with food. Their special breed addiction is fruits and vegetables. In their diet, there should be calcium, phosphorus, and vitamins E, D, and A. You can also feed him yogurt and low-fat cottage cheese. You can try feeding him porridge, soup with lean meat, or broth with vegetables. He also likes milk. Be sure to include carrots, radishes, cabbage, parsley leaves, dill, onions, cucumbers, tomatoes, pumpkins, zucchinis, and apples in their diet. 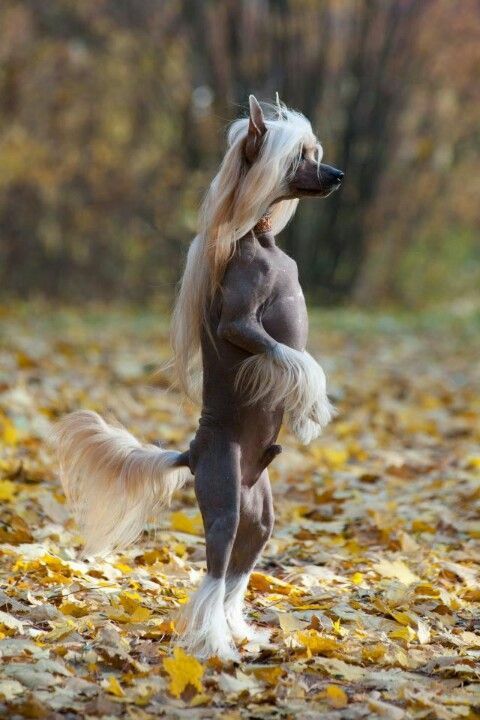 The Chinese Crested does not need much exercise, but some exercise wouldn’t hurt. You can play fetch with your dog. Make sure the object is small because the mouth of the Chinese Crested is small. You can do it 5 to 10 times if your dog knows how to fetch. That should be enough to get him the exercise it needs. Another form of exercise is taking your dog on a walk. You should use a leash on your dog when walking. A leash is important so that you can calm your dog down if it gets excited and wants to attack someone or another animal. Health problems can affect the Chinese Crested. You should be concerned about progressive retinal atrophy, which is an eye condition that can lead to night blindness, or worse, total blindness. Have their eyes examined regularly by a board-certified veterinary ophthalmologist to make sure his eyes are healthy. They are prone to dental disease because of their small mouths. Congenital deafness may also occur, as well as diabetes and hypothyroidism. Allergies can cause itchy skin and secondary infections. The Chinese Crested also frequently suffers from dry skin and comedones, so regular skin care is essential for the hairless variety. Happy and playful, the Chinese Crested likes to snuggle. He loves being the center of attention and will always work to get your complete attention. The hairless variety can be clingy, while the Powderpuff has a more independent nature. Both are affectionate with family members and people they know, smiling and taking any opportunity to make them laugh. Choose a hairless if you like the feel of a warm body under the covers. That’s where he’ll be whether you like it or not. When you’re not around, the Chinese Crested enjoys playing with his toys, inventing games, running around outdoors, or zipping over the furniture. If he ever ventures outside, he will need a stable and securely fenced yard. The Chinese Crested is extremely agile and will have no problems climbing, so make sure that your yard isn’t easily escapable. He may be small, but that doesn’t mean he’s not active. Besides playtime in the yard or around the house, a Chinese Crested will enjoy a daily walk or personal playtime. He can be good at dog sports, such as rally and agility. His alert nature also makes him an excellent watchdog. This is a sensitive dog who will be aware of your emotions. If you’re happy, he will be too. If you’re sad, he’ll try to make you feel better. Unfortunately, you may be feeling sad because he can be difficult to housetrain. It’s essential to set up a strict potty schedule if you want to be successful. Don’t give a Chinese Crested any chances to have accidents in the house. The more often he does, the more difficult it will be to teach him that it’s not allowed. Changes in his routine or distressing situations can make him lapse back into bad habits, so keep things steady. Consider training him to use a pee pad or litter box so that he has an acceptable in-home potty option for days when the weather makes the outside unappealing. However, know that giving him indoor options may also confuse him. It’s always best to let him outside so there’s no doubt in his mind where it’s correct to potty. The Chinese Crested loves to eat and is highly motivated by food. This can be great when you’re training, but if left unchecked, he may start putting on the pounds.